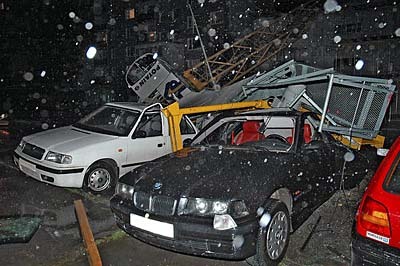 Warsaw - Hurricane-force winds claimed at least six victims and injured dozens overnight Thursday to Friday, as winter storm Kyrill battered Poland with winds in excess of 120 kilometres per hour, Poland's TVN24 news channel reported Friday quoting emergency services. 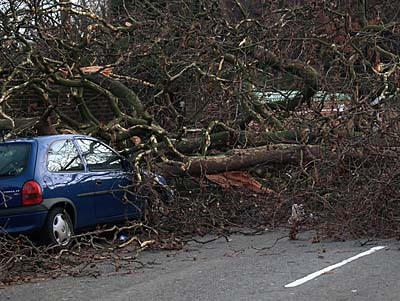 Thousands of toppled trees blocked roads, nearly 800,000 homes across the country were left without electricity and hundreds of others were damaged. Emergency officials urged the public to remain in doors overnight and to exercise caution outdoors Friday. Howling winds dropped from in excess of 120 kilometres per hour overnight to an average 80 kilometres per hour Friday, with weather forecasts predicting a further decline in wind speeds later in the day. 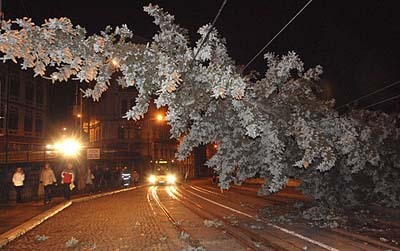 A two-ton steel beam fell off the train station façade onto an outdoor staircase 40 meters (130 feet) below on Thursday evening. A second girder likewise came loose but settled on the beam just below it. The entire train station was shut down and remained closed to passengers for 14 hours, though nobody was hurt in the incident. Service resumed at 1:30 on Friday afternoon. But questions remain as to how a major chunk of a modern, newly-built structure could simply fall off. On Friday morning, experts from the German national railway and the construction firm which built the station inspected the building to determine its safety. The first order of business was to determine whether the façade was in danger of shedding more of its steel girders.